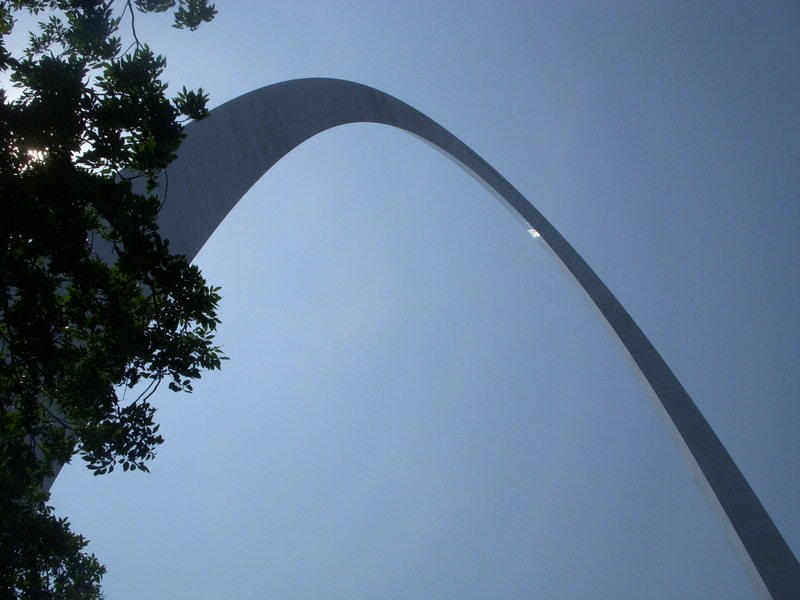 So I know I left you with a total cliffhanger last week…but I’m back to share the rest of our amazing trip to St. Louis! After trekking around the zoo and stuffing ourselves with a very hearty Italian lunch – it was time to do some more walking! 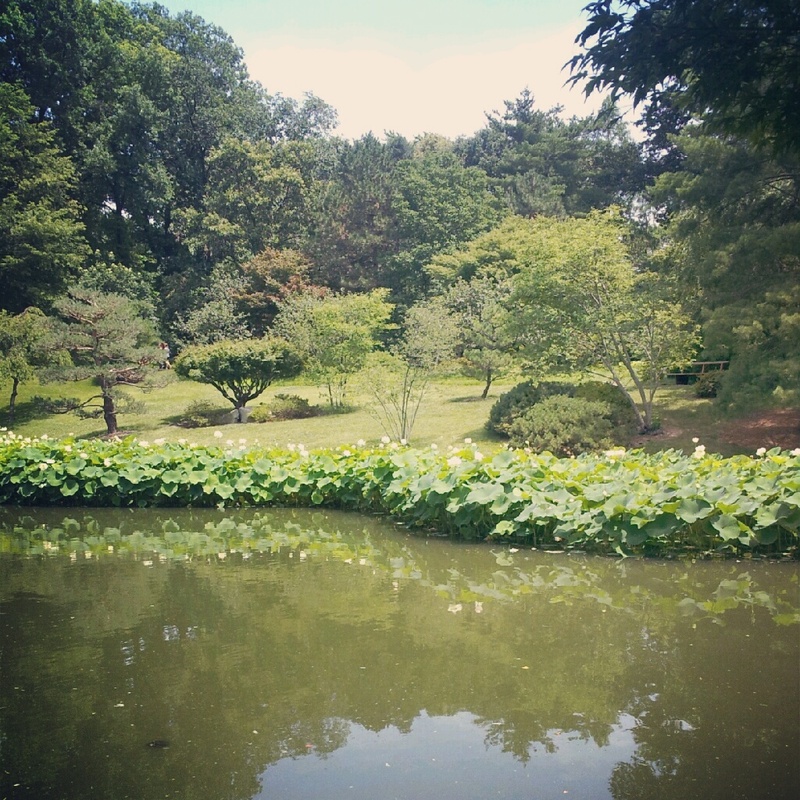 We took a 5 minute drive to visit the Missouri Botanical Garden, which was just amazing – I wish I had planned some more time to spend there! We had to look at the map and pick a few key spots that we wanted to see. We made our way back to the Japanese garden, which was absolutely beautiful – lots of picturesque bridges and flowers around the water and rock gardens. 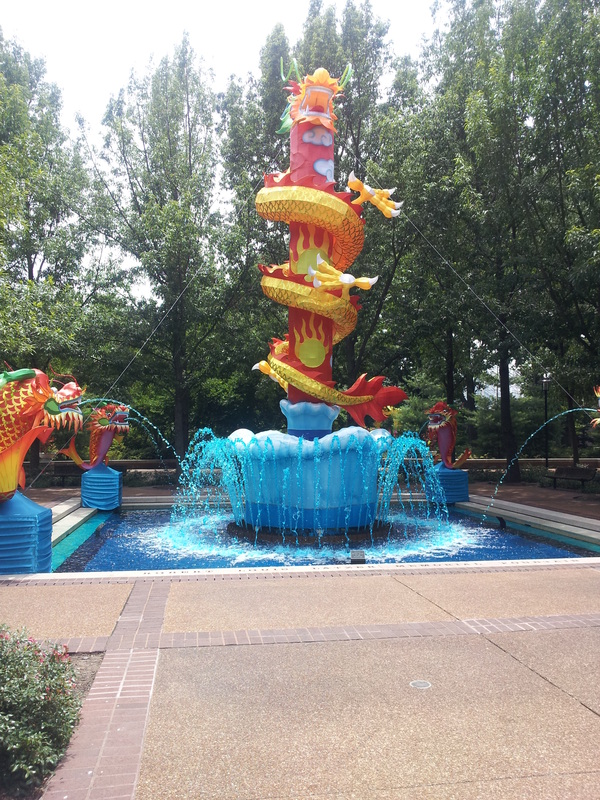 The Gardens are in the middle of a lantern festival – so there are a bunch of really cool looking lanterns in the shapes dragons, flowers, etc. We passed through “Magnolia Grove” and wandered through the day lily garden – and the husband and I both fell in love with a giant Dogwood tree that I just wanted to live under forever! Sadly, we had to make it through rather quickly in order to get to the next stop on our trip – the Anheuser-Busch Brewery! I had just done the tour a few weeks prior, but since my husband is a huge fan of Bud Light, I knew we had to stop by the very historic site – so we went to beer school. 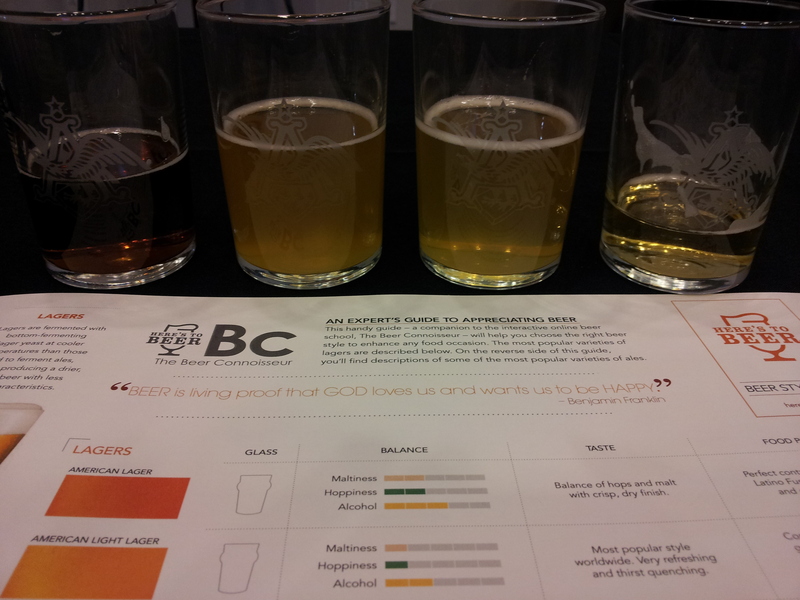 We were given four samples of beer ranging from light to dark and taught the proper glasses to serve them in and pouring techniques for each. I also think I found a new beer to drink during the summer months – hellloooo Shock Top Lemon Shandy! After wetting our whistles, it was time to check into hotel #2 for the weekend, which was downtown. We changed and headed out to the next destination – the Broadway Oyster Bar. 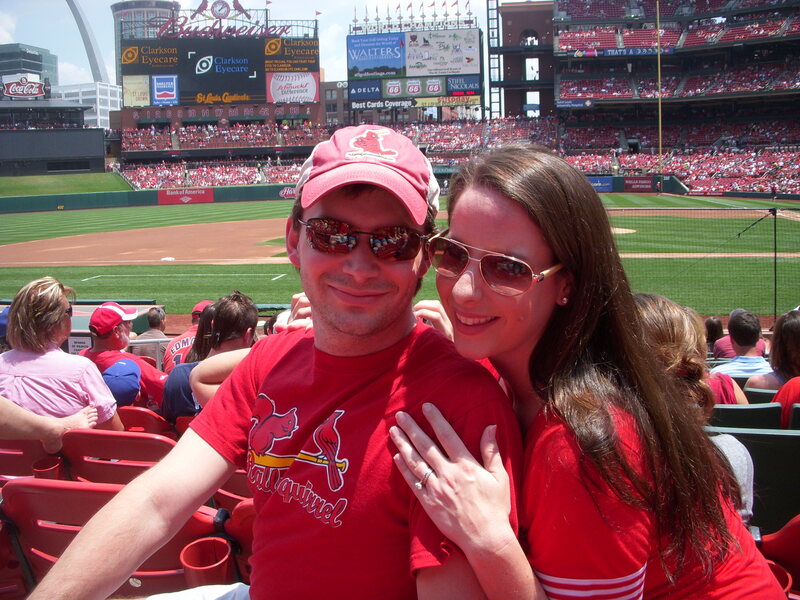 I’d read up and found out that it’s “the” place to go before a Cardinals game – and boy was it ever! 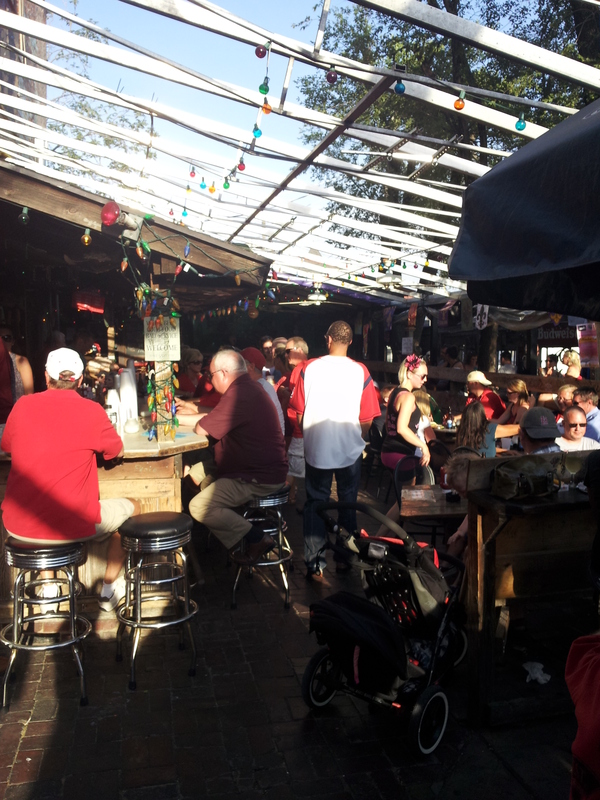 We managed to find some seats outside on the patio to enjoy some drinks before the game while listening to live music and hanging out with fellow fans. A great place to go before, and I’d imagine after, the game – not a far walk to the stadium at all! I’d love to make it back here to check out the atmosphere at night – and to eat some of the stuff I was drooling over on the menu! 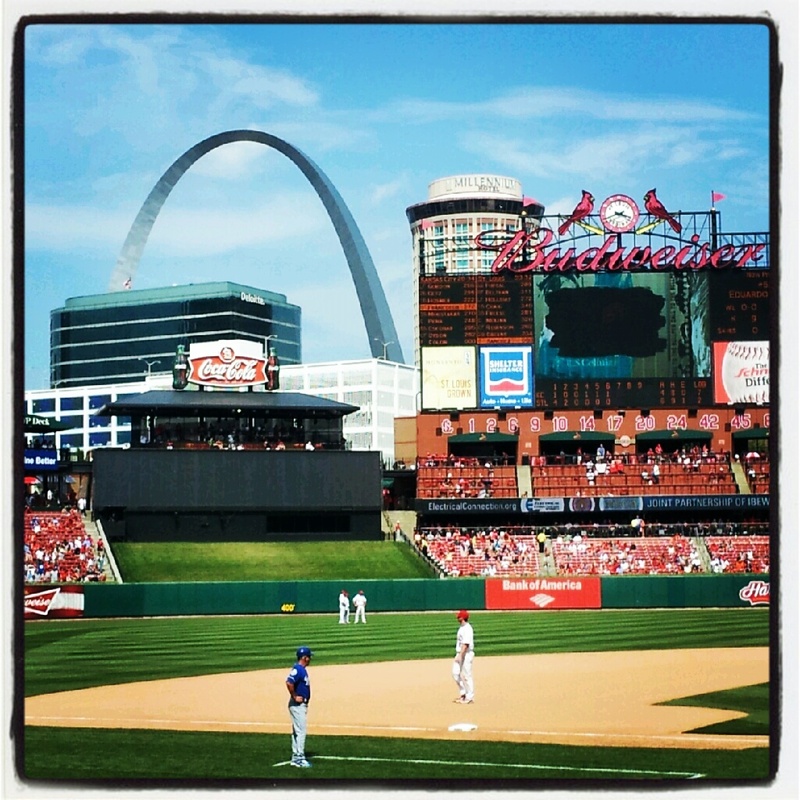 Enter Busch Stadium – I love sporting venues and this place was no different! 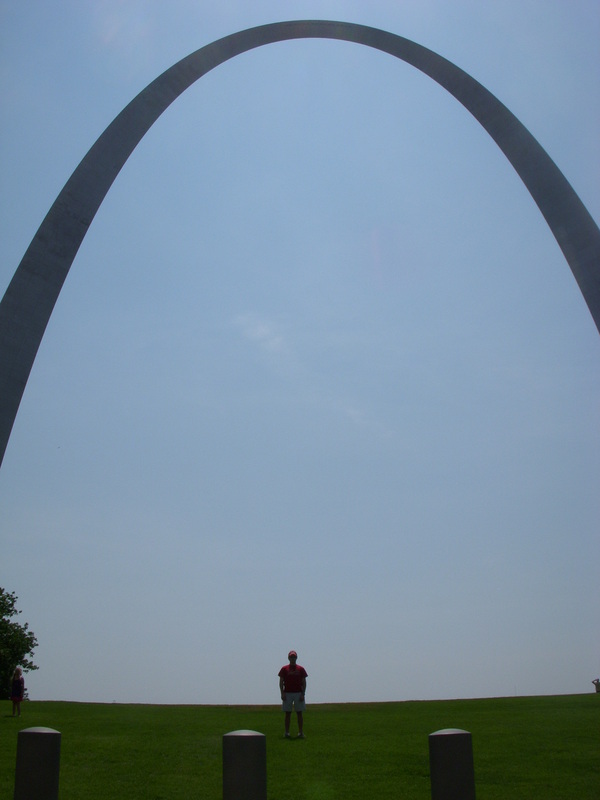 I absolutely loved the Arch in the field! We ended up feasting from the concessions for dinner (I just can’t pass up good ballpark food!) and then heading back to the hotel afterwards…a little dejected from the loss, but still a great time! 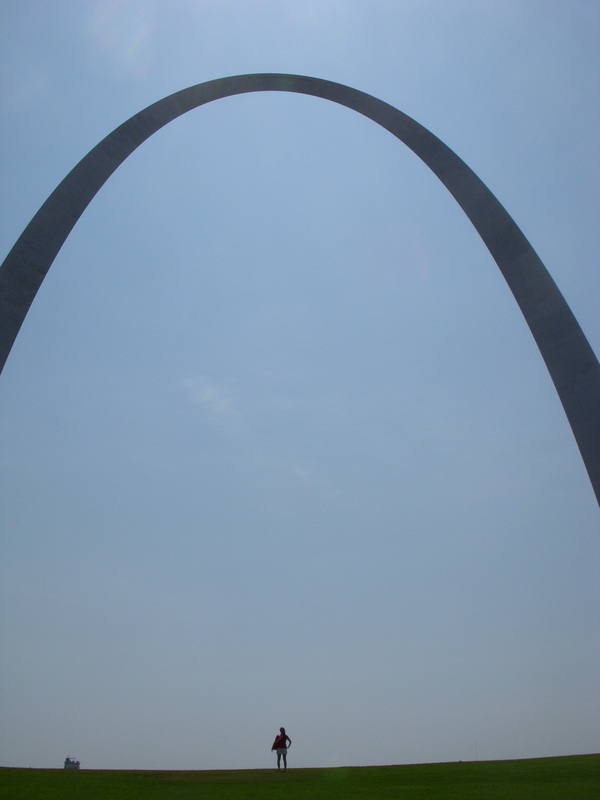 From the Arch, we took a cab to the Schlafly Tap Room. People, if you ever make it to St. Louis, do yourself a favor and go here. A lot of good beers on tap and I cannot even explain to you how good the food was – so I will, of course, show you pictures! 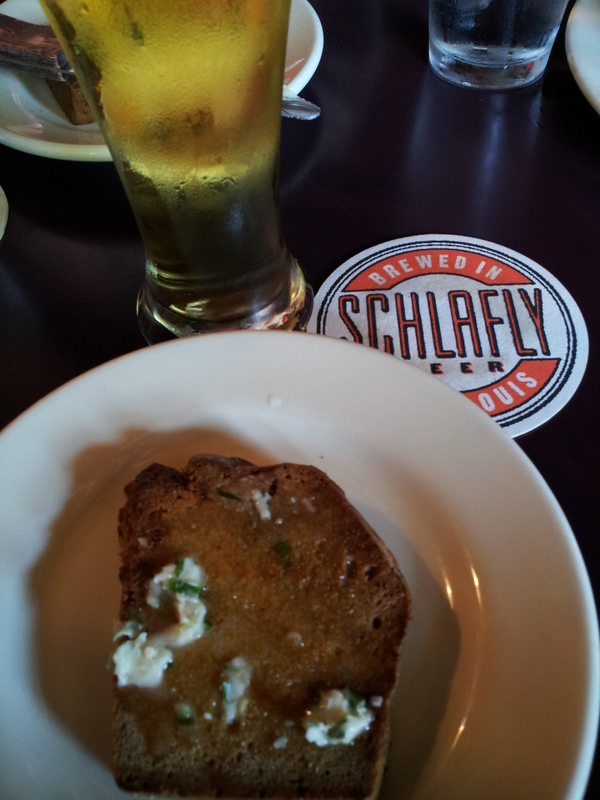 We started with some beer bread – the blue cheese cream cheese was out of this world. 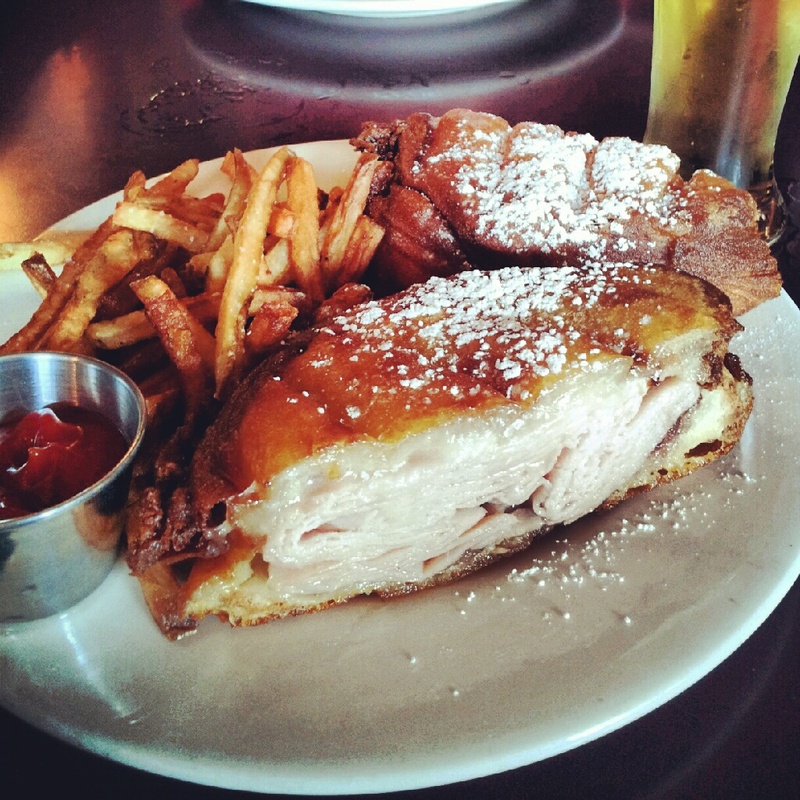 Then I had the turkey monte cristo – turkey, brie (my FAVORITE) and cranberry chutney – beer battered, deep-fried and topped with a little powdered sugar. 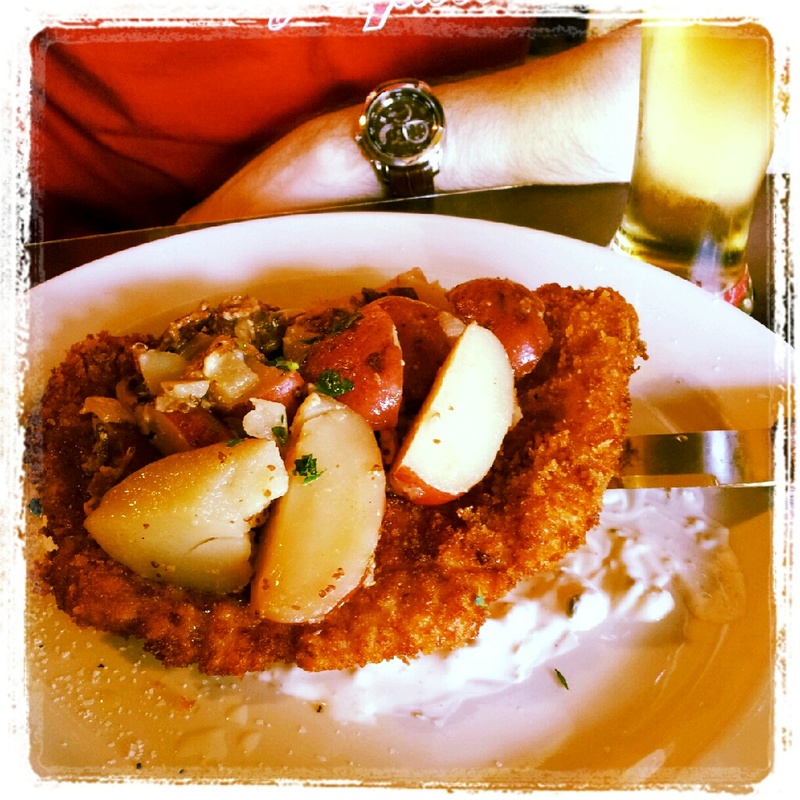 The husband got pork schnitzel on top of potato salad – it was pretty delicious too – but it didn’t have brie! (Hey, at least we walked a lot on the trip!). This place was bar food taken to a whole new level – I’m salivating just thinking about it! So then it was time to head to the afternoon game – which was the big birthday gift! We had some pretty nice seats…but let me tell you what friends, I have never been so hot in my entire life! Mis-er-able! Especially after eating that super-light meal pictured above. However, it was an exciting game and we enjoyed every single second of it. Probably even more when the sun finally made it behind the stadium! 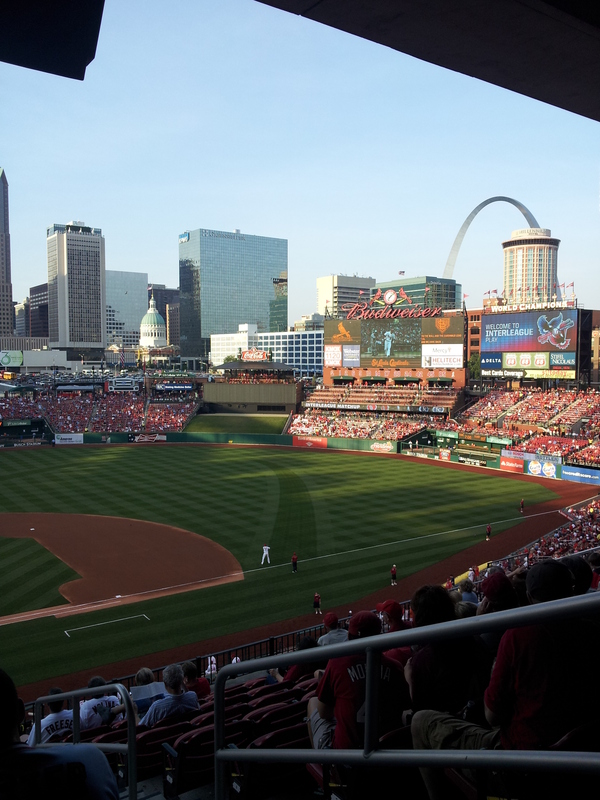 It was such a fun trip and the Cardinals certainly showed us a good time and won – so it was totally worth it! Took this one early before the combination of sweat and sunscreen took it’s toll! Well, that concludes our St. Louis trip! I hope you enjoyed a little insight into our travels and maybe were inspired to plan a trip of your own. We will definitely be back! This entry was posted in Travel by cookingonthebrightside. Bookmark the permalink.